Some years ago I asked Stuart Wade, the musical mastermind behind Down To The Bone, about the relationship between Smooth Jazz and Acid Jazz. Stuart answered: "Acid Jazz is not a refreshment for Smooth Jazz, it is totally different! I don't know if my music has an influence on Contemporary Jazz. I do know there are those within the format who would like to see me and this funky style of Jazz disappear, and have tried to put barriers in my way ever since I started." What can be a better prove for the popularity of this group and acid jazz in particular than the fact, that DTTB has now released their 9th album and sold over 500,000 copies throughout the bands previous releases. Stuart calls his new album a labor of love. His musical ideas were transferred into reality by Neil Angilley (keyboards and co-writer), Julian Crampton (bass) Tim Smart (trombone), Davide Giovannini ( drums), Mark Jaimes (guitar), Alex Bennett , Oli Silk, keyboards), Joe Beckett (percussion), Ryan Jacobs (trumpet), Tom Richards (sax). As special guest appears vocalist Imaani, best known by her performance with Incognito. Hustle is a swing-related dance, but the style in which it is performed depends a lot on your venue. Hustle is fun and rhythm. Now get on the dance floor and do the Hustle with Uptown Hustle. Fast paced, packed with horns, propelled by a rhythm guitar, that are the main ingredients of A Change Has Got to Come. Second Nature features keyboardist Neil Angilley. He has worked with many luminaries like Shirley Bassey, Vanessa Mae, Sister Sledge, US3, Lisa Stansfield and many more. He is the musician, who puts most of Stuart Wade's musical ideas into notes. The great affinity for horn arrangement like on Music Is the Key is certainly reducible to Incognito's undeniable influence on the London music scene. No wonder that one of Incognito's lead singers, Imaani is the featured songstress on Watch Me Fly. Bluey couldn't do it better. Together We Stand is another instrumental song with great affinity for Incognito's style. Superb how Neil strikes the Rhodes keys with blissful mastery. A Universal Vibe is Wade's tribute to the godfather of good vibes, Roy Ayers. South Side Overdrive stands up for tradition, brass loaded acid jazz. Vocal tracks like Closer follow concept and success of Incognito and Brand New Heavies. Down To The Bone would certainly be a top life act, if Stuart Wade would form a new band for tours. Cut and Run is another good example for the Bones further progress from clean studio groove to a more voluminous horn infected sound. 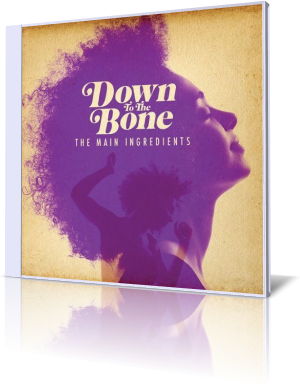 With The Main Ingredients Down To The Bone delivers crushing sound for the army of American fans. Infused with a tremendous enthusiasm and exuberance this album has the supremacy to foster new audience even in the UK.